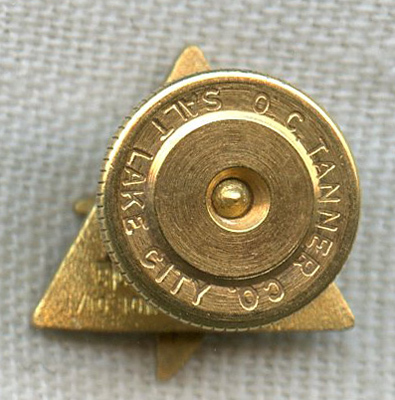 ARTIFACT: This is a circa 1960s lapel pin for five years of service with North American Aviation (NAA), a company renowned for producing notable aircraft such as the B-25 Mitchell bomber and the P-51 Mustang fighter plane. The pin is by O.C. Tanner of Salt Lake City, Utah and has a semi-precious stone chip. SIZE: Approximately 7/16� in height and 7/16� in width. CONSTRUCTION/MATERIALS: Enamel, gold-filled, semi-precious red stone chip. MARKINGS: OCT maker mark 1/10 10K on back of pin; O.C. TANNER CO. SALT LAKE CITY on backing. CONDITION: 8 (Excellent-): The pin has very little wear.